Posted on February 17, 2008 by Chad O. As of August, 2008, these deals are dead. The U810, also known as the U8240 or U1010, is a very small type of ultraportable device – it’s got a 5.6″ widescreen touchscreen that can be rotated around and used as a simple Tablet PC (albeit small), or it can be flipped up, giving you access to a physical keyboard. It’s powered by an Ultra Low Voltage 800MHz Intel CPU, and weighs just over 1.5 pounds (0.68kg), with 1GB memory, and a 40GB Hard Drive. The only major difference between the models is the software. Given that Microsoft One Note 2007 can run for $75 or more, the more expensive model is probably worth. Most of us swear by One Note. Links removed – deal is over. 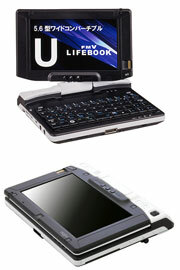 This entry was posted in Fujitsu, Sales and Deals, Touchscreen, UMPC. Bookmark the permalink.